The shooting of JFK, landing on the moon. the death of Elvis, and the Twin Towers in 2001, are all huge moments in history, but do you remember where you were the night we witnessed, arguably, the greatest ride in Supercross history? At the Rogers Centre in downtown Toronto back in 2014, James Stewart put in one of the most memorable rides in Supercross history at round 12. James has a big announcement coming up soon, so we thought it would make sense to take a look back at this Canadian night. Like always, James had the ability to see and do things on the track that others either didn’t see or wouldn’t do. The rhythm he was doing down the long straight was something that had us all holding our breath each time he approached it — it was that pinpoint and technical. I was on the floor shooting photos, so let’s have a look at the night here in this Throwback Thursday-themed photo report. A look at the 2014 Toronto track. Ross ‘Rollerball’ Pederson was honoured by the Legends group. Steve Matthes sat down with the 33-time Canadian champion. You read that right. We hosted the infamous DMX TOSX Afterparty at the Houston and Kyle Carruthers had his bike in the window. Canadian #440 Davey Fraser lined up but had some trouble on the massive triple. #14 Kevin Windham was doing his opening ceremonies transfer jumps. 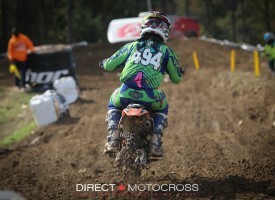 #52 Cole Thompson raced the 250 class and finished 5th in the main in front of the home crowd. #32 Justin Bogle took the 250 main win. Justin and Cole came up through the ranks together and both were pumped with the other’s performance that night. Look at young #22 (#8 on this night) getting ready to race the KJSC. He actually took the win that night in front of Canada. #1 Ryan Villopoto had food poisoning and still raced. Have you ever had food poisoning? I have no idea how he lined up and raced. James getting the pit board from the mechanics’ area. He qualified fastest. I thought that when I moved back to London I’d escaped the horrible Pizza Nova commercial jingle. They came to London! The 450 main heads into the first turn and #7 James Stewart is mired in the middle of the pack. Ken Roczen got the holeshot. I’m not usually a huge black bike fan, but #9 Ivan Tedesco and Cole Thompson’s bikes were the nicest there, I thought. James carved his way through all the heavy hitters. And eventually passed #51 Justin Barcia for the lead. Villopoto hung on for 6th that night. James lights the candles after one of the most amazing races I’ve ever seen. People are always clamoring for James photos, so feast your eyes on all these beauties. The podium: James Stewart, Justin Barcia, Ryan Dungey. What an amazing ride and race. I’m sure, if you were there, you remember this one! I hope you enjoyed this little #TBT look at that historic night in Toronto.